One in four people in the US above the age of 65 fall every year. Twenty four percent of yearly falls among elderly individuals can be prevented, provided that the individual’s risk of falling is identified. Despite the fact that accurate fall reports greatly help to identify fall risk, fall data collection and compilation have been relatively overlooked in the past. As a result, we see a great opportunity for innovation with Noti-Fall. 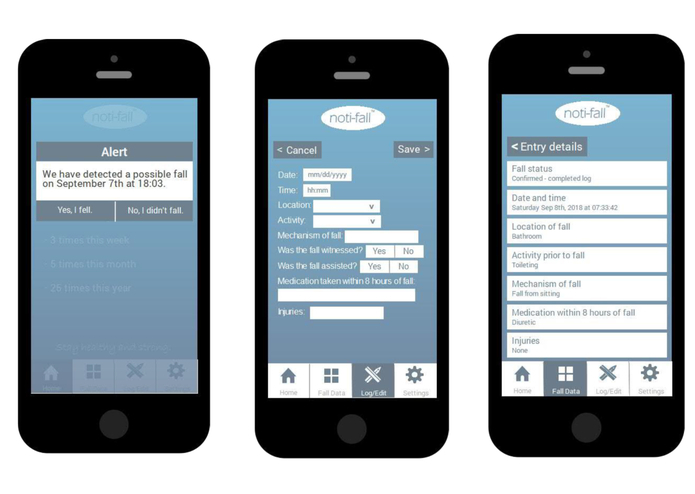 Noti-Fall detects falls by using accelerometer data, logs fall data for simple, standardized record-keeping, and consolidates this fall data into a printable format for physicians to analyze. The fall detection component allows the user to confirm or deny the fall; if the fall is confirmed, the user’s loved ones are automatically notified via text message that the user may have fallen. After a fall, the app requires the user to log key details regarding the fall, such as the location and mechanism of the fall. This data is stored in the application, and all data can be easily compiled and exported for future analysis. This application allows the fall-risk patient to easily notify loved ones about a fall, allows family members to know about fall-risk patients’ fall within a short time frame, and allows the physician to analyze standardized fall data and track fall trends. Using the CoreMotion API built into iOS, we started collecting accelerometer data from the iPhone. Using this data, we computed the sum vector magnitude of the acceleration values in the x, y, and z coordinate systems. After recognizing a fall based a preset threshold, we send a text message via Twilio’s Programmable SMS API to the patient’s given contact. Within this text message, we send information containing the patient’s name, the time of fall, as well as the location of the patient when the fall occurred using the CoreLocation API. We built our UI using Swift 4 in XCode to create a fall tracking log with information about falls within the past year. It was challenging to transfer accelerometer data acquired from the iPhone sensors to another device for analysis. In addition, it was difficult to determine the appropriate metrics for qualifying a fall. We are proud to have created an application we believe can help improve geriatric patient safety. We are committed to improving the field of geriatric care given the lack of geriatricians across the nation, and we are grateful for the incredible learning experience this weekend has granted us. From ideating our project to collecting accelerometer data to putting together our slide deck, we have learned so much individually and as a team. Over the course of this weekend, we have learned the importance of clearly defining the problem in order to come up with a solution that is most beneficial to the target population. Only after speaking to our peers as well as professionals in the field did we gain enough knowledge on the subject matter of our project to be able to determine the best product possible that we could come up with over the course of the hackathon. We hope to continue this project beyond MedHacks after incorporating feedback from our peers and the experts. We want to expand our network of experts, stakeholders, and peers to progress our project to the next level. Eventually, we hope to create a more comprehensive application that includes patient fall education components, exercise regimens, and other important factors that may directly reduce falls.